Watching the courtship display of the blue-black grassquit, Maia became fascinated with the idea that the birds’ colors could influence their mating choices and ultimately their success as a species. 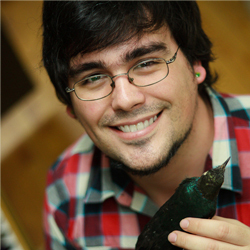 To better understand the relationship between feather color and evolution, Maia found that he needed to learn more about the underlying physics that produced the birds’ colors. He also wanted to know more about what caused the birds’ colors to change with time, as one species evolved into another. Now a Junior Fellow in the Simons Society of Fellows at Columbia University, Maia studies a range of bird species, searching for clues that could connect color evolution to the vast diversity seen in birds today. I spoke with Maia about his work, and an edited version of the interview follows. How do bird feathers get their colors? There are two basic ways. The first way is probably the most commonly understood. It’s by having pigments in the feather that absorb most colors and reflect one. Cardinals, for example, get their red color from a carotenoid pigment, which absorbs all colors except red. The second way is by the interaction of light with tiny structures within the feather. Blue is a perfect example. There is no blue pigment in bird feathers. Instead, every blue color that you see in a feather is a result of nanoscale structures in it. A bluebird, for example, has a spongy layer of keratin — the same protein that hair, horns and hooves are made of — in each branchlike extension of a feather, which is called a barb. The keratin layer in a barb looks like a sponge because it has all of these bubbles of air in it. But the organization of the bubbles isn’t random, like you see in a sponge. The bubbles are organized in such a precise way that blue wavelengths of light bounce off the bubbles and scatter back into the air, whereas all of the other colors scatter randomly or are absorbed. These colors that are produced by feather structure alone are called structural colors. When these structures are very precisely organized, like in layers or crystal-like arrangements, the color they produce also changes based on the angle at which you see the bird. These are iridescent colors, like you see in hummingbirds. They are the ones I study. Can pigments and structural colors be combined to give a bird’s feather its hue? Absolutely. Each barbule can have a layer of light-scattering keratin. Underneath, there can be rods of melanin, called melanosomes, which come in different shapes. Some are thick rods, others are thin, like fettuccine noodles. The rods, even those that are the same shape, can make different colors depending on their size and arrangement. Thinner melanosomes also give you a thinner layer of melanin and an ability to add another layer of keratin. Usually a second or third layer will be the same thickness as the first one, so they add to the reflection, and the color comes out even brighter and more vivid. Some birds even have melanosomes that are hollow. They are rod-shaped, but there is air inside them, so the light can interact with the keratin, melanin pigment and air to produce color. How do you study the evolution of color in birds’ feathers? We have used glossy starlings. This group of birds is made up of 48 species, which have diversified in Africa and a few parts of the Middle East. All of the different types of melanosomes we see in birds have evolved in this group. It’s the only group of closely related species that have this big diversity of melanosomes. There are a total of four different types of melanosomes — rod, flat, hollow rod and hollow flat. Each species will only have one of the four, but they are not exclusive to that species. Having the different types of melanosomes in these birds allows us to compare the consequences of evolving different color-generating structures with how quickly color evolves and how quickly new species form. Of course, we can’t see feather color evolve. But we can compare the relationships among species and model how traits evolved over time. We found that, compared with species that have the basic type of melanosome, species with innovations in melanosome shape and in keratin layers can evolve their feather color up to 40 times faster. What does it mean for the color to evolve up to 40 times faster? Say, for example, there is a species of starling that has a blue plumage. A population of that species spreads out to a new area, like across a river or over a mountain, and in this new area, maybe females evolve a preference for a greener plumage in males. Over many generations of females selecting slightly greener mates, and therefore having slightly greener chicks than the previous generation, you could have color evolving such that after a couple million years that population looks a lot greener. Now, if the same thing happened in a species that has one of the novel melanosomes, you would have a population evolving that same change in color after only about 50,000 years. How do the pigments and structural colors you see in modern birds relate to the colors ascribed to their ancestors, the dinosaurs? We know that some pigments are extremely ancestral, especially melanins. Other pigments, like carotenoids that are responsible for yellows, oranges and reds, are more recent innovations. There have been studies that try to infer what colors dinosaurs were, based on pigments found in their fossils. It’s harder to know about structural colors, however, because the generation of color is based on the organization of tissue. The organization itself isn’t well-preserved, though some dinosaur fossils do show that structures in the feathers may have been organized in a way similar to what we see in the glossy-black feathers of starlings, ravens and other birds. 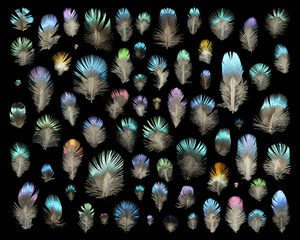 How does your work on bird feathers deepen our understanding of life’s diversity? Birds are one of the most diverse groups of animals on the planet. Their feathers can act as signals that drive social interactions. We are a very social species ourselves. We are always in situations where we are asking ourselves why we behave certain ways. By looking at birds, we’re looking at how complex behaviors, ones not affected by consciousness or intention, evolved. These behaviors shape how animals look and act and how fast they change over time. We can answer these fundamental questions about evolution through the lens of complex social interactions, thereby helping us piece together the story of life on Earth.